Earlier this year, a group of indie filmmakers set out to create a documentary on the hit indie game Minecraft. The filmmakers had an idea and some footage, but no funding. But thanks to a wildly successful fundraising campaign on Kickstarter, Minecraft: The Story of Mojang is now in full production. I recently had the chance to speak with to Asif Siddiky, director of photography for 2 Player Productions about how they got started, where Story of Mojang is going, and how their new project began. Two Player Productions (2PP) is a Portland-based production company that creates documentaries on video games and gamer culture. 2PP first got noticed with Reformat the Planet, a 2008 documentary about the underground Chip Music scene where artists create new music using old GameBoys and other outmoded video game tech, and BlipFest, the yearly chip music gathering in New York. Reformat the Planet rocketed the team to geek prominence, and led to work with Web-comic juggernaut Penny Arcade on the first season of their PATV video series. The idea for Story of Mojang soon followed. "We had just finished our run on the first season of the Penny Arcade series. And we were working with Sony on behind-the-scenes stuff for various games. We decided we were going to produce a series of documentary shorts for various games and were looking to make a pilot." The 2PP guys were all big fans of Minecraft, an addictive sandbox game that lets you build just about anything, which was just starting to become a hit last summer as they were kicking around ideas. They soon decided Minecraft would be perfect for their pilot. "Paul emailed [Minecraft creator] Notch out of the blue to see if we could come to Sweden, they wouldn't have to pay anything we were going to pay out of pocket. We went out there for about a week and it became obvious there was a lot more story here." Instead of a short piece on the origins of Minecraft, the group would chart the first year in the life of Mojang, the game company Markus Persson (better known as Notch) created using the profits from Minecraft. Once 2PP realized they had a full length movie on their hands, the next question was how to finance it. "As we were sitting around thinking about how we were going to do this it just came up kinda organically that we could just do a Kickstarter campaign. We'd seen a few projects from our friends that were super successful and as we thought about it more it just seemed like a perfect fit." It was. The campaign met and then exceeded its $150,000 goal eventually raising over $200,000 and becoming one of the most successful projects in the history of Kickstarter. Now that funding is in place, the group is hard at work filming for the project. 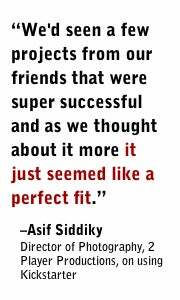 When I spoke with Asif, he was still recovering from jet lag. He'd just flown back from Mojang's offices in Sweden earlier in the week for one of several phases of shooting. In order to cover the full first year of the company's life, 2 Player Productions plans to make several trips, documenting different milestones for Mojang and the production of Minecraft. The team has a trip planned for next month's E3 gaming conference where Mojang will be making an appearance. 2PP will then head back to Sweden in August for a less traditional production milestone: Notch's wedding. Even though The Story of Mojang takes up a great deal of their focus, 2PP is also working on several other projects. The team is working on more more behind the scenes projects like their earlier work documenting games like Infamous and Uncharted 3 and also looking to pick up where they left off before The Story of Mojang came along. "We'll probably continue to work on the idea of a series. We'll continue to cover that even over this year and keep that all stockpiled. It's hard to predict though because this stuff comes up so fast."